Each of these musicians wrote 5 number charts in his or her style from the String Of Pearls cd. For example, the song, String Of Pearls, has charts written by: Charlie McCoy, Brent Rowan, John Hobbs, Jimmy Capps and Biff Watson. The song, Waylon, has charts written by Tony Harrell, Lura Foster, Chris Farren, Biff Watson and Eddie Bayers. The idea is that you’ll be able to compare, side by side, some of the different styles of notation and symbols you can use to chart the same piece of music. So, as you listen to a song on the cd, you can flip between different charts written of the same song. These different charts represent the kinds of numbering techniques that you are liable to run into in almost all of the major recording and television studios, clubs, showcases, rehearsal halls, and other situations where music is performed in Nashville. "I'd say 95% of the time we use Number System charts. The one really great advantage of the Number System is the ease of transposition--if a singer comes in and the song is in F and he or she says, 'No, I want to do this in Eb', you'd have a problem with a regular chart. You'd have to rewrite the whole thing. Whereas with the Number Chart, you just say, 'Eb? Okay!'" Another new addition to edition 7 is a collection of charts handwritten by some of Nashville’s best musicians and producers. 17 people who are doing sessions everyday and really influencing how music is made in Nashville, were kind enough to send me session charts they had written. Some of these players, like Dann Huff, you may have heard of from producing Keith Urban and LeAnn Rimes, but you may not have heard of Jeff King, who’s played guitar on records by Reba McIntyre, Phil Vassar and Randy Travis; or Mike Chapman, who played bass on all of Garth Brooks records. Also available for $18.99 as a downloadable version for computer or iPad! 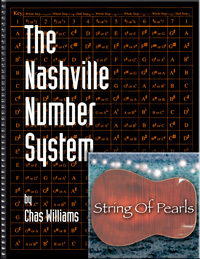 © 2008 Nashville Number System/Chas Williams. All Rights Reserved.